A pipeline that supplies much of Michigan’s natural gas could be shut down … and converted to carry crude oil. That’s sparked a number of concerns from business and government. Rina Miller reports. Natural gas is plentiful and cheap right now. That’s why a Texas company filed a request with the Federal Energy Regulatory Commission — or FERC — in July to shut down 770 miles of transmission lines across several states. It would either abandon them … or eventually use the pipes to carry crude oil. And that could affect how much a lot of people in Michigan will pay to heat their homes and businesses. The pipeline owned by Trunkline Gas Company crosses into Branch County from Indiana. That’s where Consumers Energy connects to it … and distributes the natural gas to 45 counties in the Lower Peninsula. Dan Bishop is a Consumers Energy spokesman. He says Consumers depends on Trunkline for 60 percent of the gas it supplies to 1.7 million customers in Michigan. Consumers Energy has filed an objection to Trunkline’s plan. Bishop says Consumers wants Trunkline to withdraw its proposal as a bad idea. Governor Rick Snyder, the Michigan Public Service Commission and a coalition of large businesses, called ABATE have also filed objections to the proposed pipeline shutdown. Tamara Young Allen is a Federal Energy Regulatory Commission spokeswoman. She says converting gas pipelines to crude oil isn’t unusual, but she couldn’t comment specifically on the Michigan case … because the matter is still pending. Young Allen says FERC does not regulate the siting of oil pipelines. She says states make those decisions. Trunkline Gas Company did not respond to requests for comment. For the Environment Report, I’m Rina Miller. 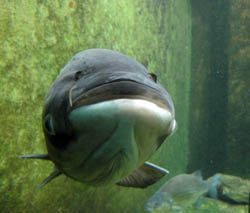 There’s new evidence that Asian carp could be in western Lake Erie. Last month, crews took 150 water samples from Sandusky Bay and the Sandusky River. They were testing for traces of genetic material from Asian carp. The results just came back this week. 20 of those samples tested positive for the presence of silver carp. Now, these positive samples could indicate there are live carp in the lake. But biologists say the genetic material could’ve also come from dead carp, or fish-eating birds or boats that came into contact with Asian carp. Duane Chapman is a fisheries biologist with the U.S. Geological Survey. He says if there are live carp in Lake Erie, there probably are not very many of them. And he says silver carp are especially hard to catch. Crews from the federal government and the states of Ohio and Michigan have been searching for live carp in Lake Erie. But they haven’t found any yet. This story was reported and written by Suzanne Jacobs. Delray is a neighborhood in southwest Detroit. People who live here are surrounded by heavy industry. A proposed new bridge to Canada is planned to land in the Delray neighborhood. The construction could change how the neighborhood looks. It’s estimated that thousands more trucks will pass by the neighborhood every day. A bunch of kids are climbing on a playground. Two of them are playing tag, laughing and running themselves breathless. But just past the red and yellow playground are two tall smoke stacks. If you look closely, you can see a green haze creeping out of them. Simone Sagovac is with Southwest Detroit Environmental Vision. The non-profit group has been working to clean up southwest Detroit for 20 years. Those stacks above the playground are part of the wastewater treatment plant. The plant serves about a third of Michigan’s population. And it burns some of the waste that enters the facility using 1940s incinerators. Next to the plant is a composting facility. But those aren’t the only industrial sites nearby. Rachel Burke has lived in Delray for 9 years. Burke says between the heavy industry and constant truck traffic, it’s not unusual for the neighborhood to smell. The industries and neighborhoods in southwest Detroit grew up around each other. Simone Sagovac says Delray has been zoned for heavy industry for decades. Delray’s population has dropped dramatically. At its peak in the 1930s, the neighborhood had about 30,000 residents. In 2010 there were fewer than 3,000. But many people in Delray can’t afford to move. Others don’t want to. Fannie Barber has lived here for more than 65 years. Her house is across the street from a rail yard. It looks worn from the outside, but the inside is pristine. But Barber says she’s worried about what the proposed new bridge would do to the neighborhood. If it’s built, houses would come down; businesses would be relocated. Some people would be paid to relocate… but others would not be bought out. They’d have to live with the bridge. But some people here welcome the bridge. In June, Michigan and Canada agreed that the people of Delray should get community benefits if the bridge is built. Some people are hopeful the benefits package will mean good things for the community… like better jobs. But it’s not clear what will happen in Delray, because there are no concrete plans yet. You can learn more about the new international bridge debate in Michigan Watch’s recent five part series by Lester Graham. Enbridge asked the Court of Appeals to drop that lawsuit, but this week, the court denied that request, and the case will go forward. Katy Bodenmiller owns land with an easement for the oil pipeline. She’s not a plaintiff in the lawsuit, but Bodenmiller says the court’s decision to let the case go forward feels like a small victory. “I think at the very least in the absence of leadership on this issue in this state from our public officials, this suit can perhaps force Enbridge to answer some questions that they have up to this point been able to side step,” said Bodenmiller. The lawyer representing the landowners in the case, Gary Field, says the court’s decision will give homeowners an opportunity to have their say. An Enbridge spokesman says this case might not be decided until sometime next year. In the meantime, they’re moving forward with construction. They say details of the project were laid out in their application to the Michigan Public Service Commission. Neal Fisher thinks he’s an environmentally friendly kind of guy. He and his wife recycle, they use compact fluorescent light bulbs in the house, they walk most places and hardly ever use their car. But when it comes to outdoor grilling… it’s charcoal all the way. On tonight’s menu, it’s burgers, Jamaican jerk chicken, onions, and asparagus. Everything is grilled on basic, 22 ½ inch Weber kettle. “Nothing fancy, no frills,” says Fisher. To get the fire started, Fisher throws about 7 or 8 pounds of hardwood lump charcoal into a chimney starter. To find out if Fisher really is a carbon Sasquatch, I called up Eric Johnson in Switzerland. “Basically the footprint of using charcoal is about 3 times higher than the footprint of gas,” says Johnson. Johnson published a study in the journal Environmental Impact Assessment Review. 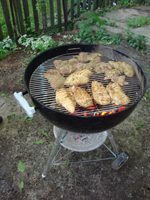 In it, he compared the carbon dioxide emissions – or carbon footprint – of the two most popular types of grills: charcoal and propane gas. When it comes to straight up carbon emissions – gas grills win hands down. Run your gas grill for an hour; emit 5.6 pounds of carbon dioxide into the air. Use charcoal briquettes for an hour of grilling; emit a whopping 11 pounds of CO2. But what if we look at the total carbon cycle of propane gas, a fossil fuel and charcoal, which is a bio fuel? For that answer, we’ll turn to Bill Currie. He’s a professor in the School of Natural Resources at the University of Michigan. “You have to think about, can we replace the carbon back in the pool that charcoal came from? Can we replace it biologically over a reasonable period of time? And with charcoal, the answer is yes, we can re-grow those trees,” says Currie. That’s because charcoal is made out of wood, which is a renewable energy source. So if charcoal is harvested locally in a sustainable way, the re-grown trees can absorb the CO2 – which makes charcoal essentially carbon neutral. So charcoal made out of wood which is renewable. Propane gas on the other hand is made from oil. Not renewable. “Fuels that are based on coal, oil, petroleum based fuel, it’s not possible to put that CO2 back where it was biologically in a reasonable amount of time. And that’s the big difference,” says Currie. But does any of this really matter? I mean, how important is grilling in the overall environmental scheme of things. Well Currie says it’s definitely not a big-ticket item like, say, the size of your house or the number of cars you have. “It’s probably a small factor in the whole analysis. But at the same time, we make dozens or hundreds of these choices a day. And if we know that one alternative is better than another, these little things do matter because they add up,” says Currie. 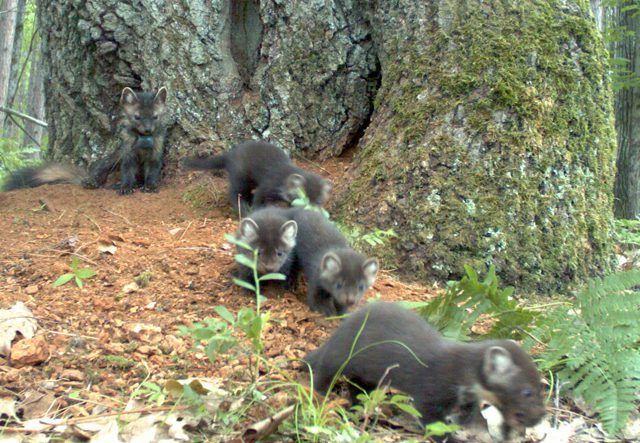 Pine marten is the smallest predator in the northern forest. It’s a member of the weasel family…related to otters and ferrets. It weighs roughly two to two-and-a half pounds, has big furry ears, a pointed nose, a bright orange patch on its chest and a bit of a temper. Jill Witt is a wildlife biologist with the Little River Band of Ottawa Indians. 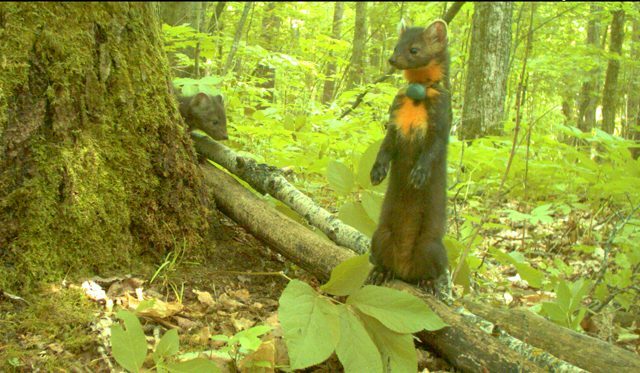 She has a marten caught in a wire cage tucked next to a fallen log, half buried in twigs and leaf litter. More than 80 years ago, martens lived in big pine trees before logging, wildfire and trapping wiped them out. 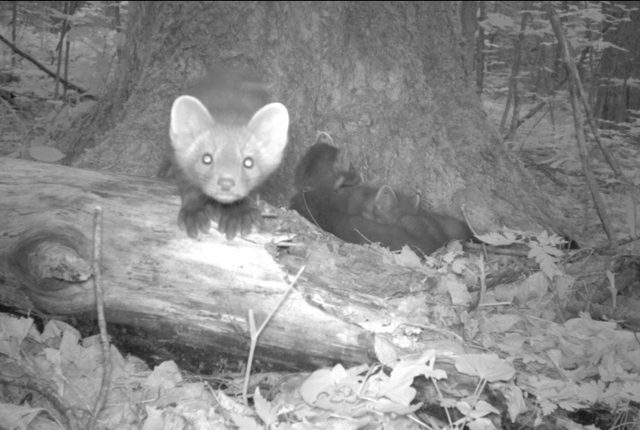 The marten that are here appear to be doing okay in the Manistee National Forest. But the population doesn’t appear to be growing or spreading. Researchers think one reason might be that the prime habitat is isolated. So there aren’t places in between for martens to get a toe hold. But the study also is looking at other possibilities. Veterinarian Maria Spriggs uses a gas to anesthetize the marten. She lays it out on a cloth on the tail gate of a pick-up truck and monitors its heart rate and oxygen intake. She’s the vet at Mesker Park Zoo in Evansville Indiana. She declares it a robust male. One of the main points of the study is to find out if there are signs of in-breeding or disease. That could be a key reason why the animals aren’t doing better. After the fit of a new radio collar meets her approval, Spriggs places the marten in a wooden box lined with a towel. 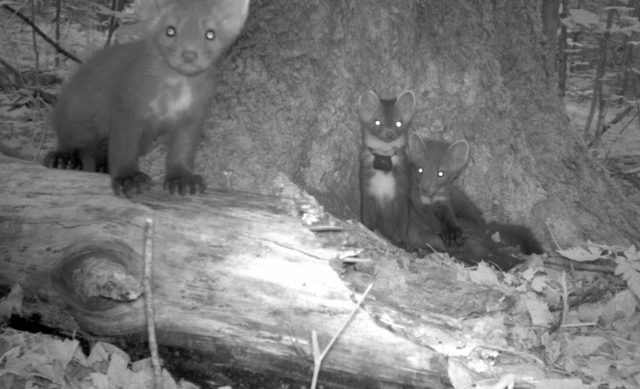 Paul Keenlance likes the marten’s feisty attitude. He’s a professor of wildlife biology at Grand Valley State. 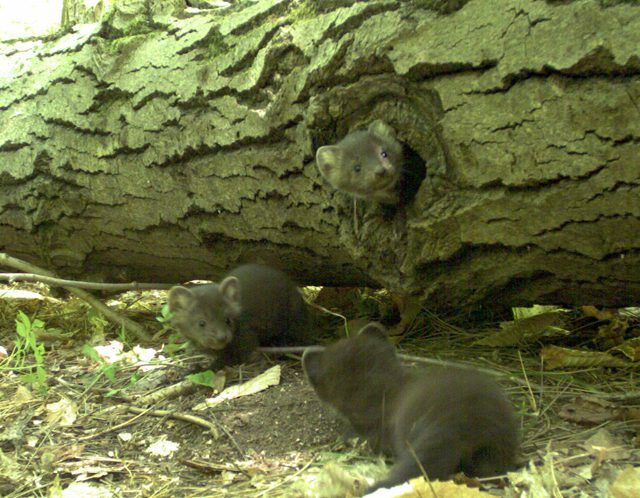 Keenlance thinks forest managers could make a few changes to help martens recover without a lot of restrictions or costs. 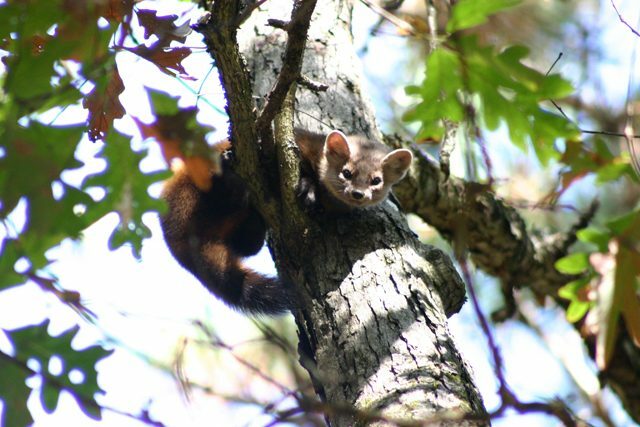 For American Indians, the marten isn’t just related to the health of the forest but it’s also connected with the health of the people. That’s why the Little River Band is putting so much effort into the research. Jimmie Mitchell is head of natural resources for the tribe. There is a tradition for families to identify certain animals as part of their clan. Members of the marten clan were warriors and stood for courage. Mitchell says the tribe wants to hold on to those traditions because they still have value today. In the Manistee National Forest, for the Environment Report, I’m Bob Allen. And today the eel-like fish are still more numerous than fisheries biologists would like. Lamprey keep lake trout from recovering and also attach to white fish and salmon. The U.S. Army Corps of Engineers is ready to build a new barrier on the Manistique River and Michigan’s willingness to own the dam could allow that to happen by 2014. For the Environment Report, I’m Peter Payette. Figuring out how your food is grown is not always easy to do. Sometimes there are labels saying things like “free-range” or “certified naturally grown” but it can take some work to figure out what that means. That’s Cara Rosaen. She and her husband Karl wanted a lot more information. They wanted our food system to be more transparent. 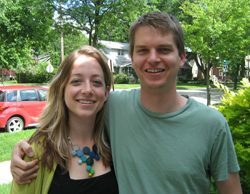 Two years ago, they founded a startup company called Real Time Farms.com. It’s a crowd-sourced food guide that lets you learn more about the farms in your area. The website shows a map of the U.S. with a bunch of dots on it. When you zoom in you can see photos of specific farms and what they grow. Karl Rosaen shows me how it works. Anybody can visit a farm, take photos and add what kinds of things the farmers grow and how they grow them. Cara Rosaen says they’ve decided to make the site neutral. So they’re not promoting one kind of farm over another. She says they decided early on they didn’t want any advertising to clutter the site. But of course, they also had to make money. Karl Rosaen is a software engineer. He was part of the team that launched Google’s first Android device. A few years ago, he quit his job at Google, he and Cara moved back to Michigan, and they started Real Time Farms. Karl designed software to allow restaurants to link menu items online back to the farms they came from. And they’ve been selling the software to restaurants and food trucks. Paul Kessenich owns Darcy’s Cart in Ann Arbor. There are about a hundred restaurants linked to farms on Real Time Farms’ website. But like any startup… things change. The Rosaens are now shifting away from working with restaurants… although they’ll let their current customers continue to use the software for free. Real Time Farms is joining forces with a crowd-sourced cooking site called Food52.com. Karl and Cara say they’re hoping to reach a lot more people this way… and get them more connected to the places their food is grown. 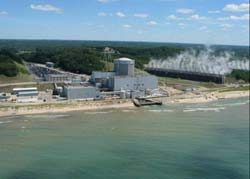 The Palisades Nuclear Power Plant near South Haven has shut down again. This is the second time this summer Entergy Corporation has had to shut down the plant for repairs. Lindsey Smith is Michigan Radio’s west Michigan reporter and she joins me now to get us up to speed. So, Lindsey – the plant shut down to fix a water leak. I thought they just fixed a leak? LS: This is a different leak. The company noticed this leak when they restarted the plant after fixing that first leak in a tank above the control room. This leak is in a different area of the plant – the containment building. This building holds the nuclear reactor itself. RW: Where’s that water going? LS: I asked Prema Chandrathil that question. She’s a spokeswoman for the Nuclear Regulatory Commission. Chandrathil says the situation at Palisades is “serious” though. The NRC now has a specialized inspector to assist regular inspectors at the plant while the company makes repairs. RW: Do we know what’s causing the leak yet? LS: Not yet. Palisades Spokesman Mark Savage says they’ve determined that a “control rod drive package” is the source of the leak. There are 45 of these control rods. Plant operators can raise or lower control rods to control the rate of the nuclear reaction. But Rebecca, there are a lot of people, nuclear watchdogs in particular, who are quick to point out that Palisades has had a number of problems with these control rod drives. RW: Problems they’ve had recently? LS: Yeah, I mean this is the second time this year alone Palisades shut down to fix a leak related to these control rod drives. Back in January they replaced some seals on the rods that were worn out. But the Union of Concerned Scientists notes control rod problems at Palisades that go back decades. David Lochbaum directs the Union’s Nuclear Safety Project. Indeed, Palisades’ spokesman Mark Savage says they have yet to determine the cause of the leak. RW: So what are they going to do? LS: Savage says they’ll completely replace at least one of those 45 control rod drive packages. Lochbaum with the Nuclear Safety Project says that’ll only work if it resolves the underlying problems. He says the NRC needs to do more to make sure the root cause is identified and fixed this time. RW: Lindsey, you’ve been reporting that the Palisades plant had a series of problems last year that left it with one of the worst safety ratings in the country. But the NRC has continued to say that the plant is operating safely – are they still saying that? Lindsey: Yeah, they say that if the plant was ever not operating safely they would not hesitate to shut it down. That’s what they always say; they’re still saying that. But we do have a lot of problems with safety culture; that has been a problem at Palisades, and the next inspection that goes along with that will be in September. That’s really the big inspection next for Palisades. RW: All right, Lindsey, thanks for staying on top of this. Lindsey Smith is Michigan Radio’s west Michigan reporter. It’s something we don’t like to talk about, but cancer is all around us. It would be hard to find someone who hasn’t been touched by cancer – not just someone you know – but someone you love. In Living with Cancer, a special one-hour documentary from Michigan Radio, we’ll explore how much we really know about the connections between cancer and the chemicals in our environment. We’ll meet both regular people and scientists trying to figure out if certain towns around Michigan are struggling with more cancer cases than other places because of current or past pollution. You’ll hear about whether or not turning to the courts makes sense when it seems a company might to be blame for putting people at risk of cancer or other illnesses. Finally, we’ll look at where we go from here. What do researchers know, and where are they looking next? Governor Rick Snyder signed a bill this week that broadens building permits on what are called critical dunes. Those are dunes that have the most environmental protection. Rachel Hoekstra is the legislative Director for the Senator who introduced the bill. She says the previous law had too many regulations for building permits. But opponents of the new law say it puts those critical sand dunes at risk. Nicholas Occhipinti is with the West Michigan Environmental Action Council. He says the new law reduces the control of the Department of Environmental Quality to work with property owners in order to protect the sand dunes. He says critical sand dunes make up 30% of all sand dunes in Michigan. For the Environment Report, I'm Emily Fox. Maybe you’ve noticed you haven’t been swatting a lot of mosquitoes this summer. That’s Michael Kaufman. He’s a mosquito expert and an associate professor at Michigan State University. Think of nuisance mosquitoes as the kind that attack you in swarms. Kaufman says it’s been so dry… that we haven’t had the usual bursts of mosquitoes that you get after a big rain. But he says ironically… our hot, dry summer has been ideal for the species of mosquitoes that carry West Nile virus. The species Culex pipiens is the one experts are most concerned about… and those guys like it when it’s hot. Kaufman says they also like standing water in bird baths and kiddie pools. He says because it’s been so hot for so long… we’re seeing cases of West Nile virus pop up in humans and animals a few weeks earlier than normal. Erik Foster is a medical entomologist with the Michigan Department of Community Health. He says so far this year in Michigan, there have been four confirmed cases of West Nile virus in humans. But he says it’s really difficult to predict what will happen with the virus each year. Foster says you can get infected with West Nile virus without having any symptoms. You might also get just a mild flu-like illness. But he says some people can become seriously ill.
Foster says people over age 50 are more likely to develop serious illness from West Nile virus. 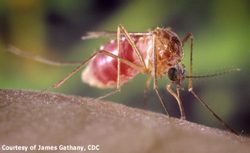 People have been getting sick with West Nile virus since 2002 in Michigan, but Foster says no one knows how much of the population might have immunity by now. So he says… the best thing to do is to avoid getting bitten. There are easy things you can do, like drain any standing water around your house and make sure your window screens are in good shape. He also recommends using bug repellant when you’re outside. If outdoors, apply insect repellent exposed skin or clothing that contains the active ingredient, DEET. Repellents containing Picaridin or Oil of Lemon Eucalyptus have recently become EPA approved and recommended for use by CDC. (Be sure to follow the manufacturer's instructions). For more information on mosquito repellents, click here. Empty standing water from flower pot bases, pet bowls, clogged rain gutters, swimming pool covers, discarded tires, buckets, barrels, cans, etc. Crews with the U.S. Fish and Wildlife Service and the departments of natural resources from Michigan and Ohio are searching Lake Erie for Asian carp this week. They’re stepping up their sampling efforts because of lab results that showed six water samples from Lake Erie had positive environmental DNA hits for Asian carp. Those water samples were from August 2011. So the teams are now out on the lake to see if they can find any more evidence of bighead or silver carp in the lake. Todd Kalish is the Lake Erie Basin Coordinator with the Michigan DNR and he joins me to talk about the carp search. So, a positive eDNA sample could mean there are live Asian carp in Lake Erie… but there are other possibilities – what else could lead to a positive DNA sample? Todd Kalish: A positive DNA sample basically means that some part of a carp was left behind within 24 hours of a sample being taken. And so it could’ve been a scale or mucus or excrement. Basically what it tells us, and what we assume, that environmental DNA means there was a silver or bighead carp in that area within 24-48 hours of the sampling. RW: So if that genetic material is present, where else could it come from if not from a live carp? TK: Well, it could come from a variety of other areas and the U.S. Army Corps of Engineers is currently conducting a study to identify where the other potential areas that positive environmental DNA could come from, so like ducks or birds or things like that, that may have picked up environmental DNA in one water body and transferred it to another. So there are other ways of introducing silver or bighead carp DNA into a water body than actually a live carp. RW: What’s the plan if you do find a live carp in the lake or more positive DNA? TK: If a live bighead or silver carp is collected, one of the first things we will do is get as much information about that fish as we possibly can. And so, the fish would be taken to an Ohio DNR or Michigan DNR facility. We would determine whether or not it was reproductively viable, we would age the fish, and then there would also be an enhanced sampling protocol. RW: What would it mean if you discovered that there were a reproducing population of Asian carp in Lake Erie? TK: It could have some significant negative effects on the fisheries community. Lake Erie and Lake St. Clair, which are connected, they provide really good habitat for silver and bighead carp, and we have a very good fisheries community in those two lakes right now. The walleye population is very good and yellow perch population is good, we’ve got smallmouth bass in both of those lakes, and those populations would likely be impacted if there were a reproducing population of silver or bighead carp within Lake Erie or Lake St. Clair. RW: We’ve also had other carp news lately. The Michigan DNR announced last week that a grass carp that was caught in the St. Joseph River in southwest Michigan and it was capable of reproducing. How big of a deal is that? TK: That’s a big deal. Grass carp are a prohibited species in the state of Michigan. And so grass carp are illegal to transport or have in your possession alive. Grass carp are extremely voracious, so they can eat 40-50% of their body weight in one day, and they specifically target vegetation, so they can remove significant amounts of vegetation, which is really critical to sustain a healthy aquatic ecosystem. RW: Todd Kalish is the Lake Erie Basin Coordinator with the Michigan DNR. Thank you so much. It seems that everyone is talking about the bad cherry crop this year. We’re in the tasting room of Good Harbor vineyard on the Leelanau Peninsula. It’s a family run farm that originally only grew cherries. The farm started growing grapes in the 80's because it was more profitable. Sam Simpson is the wine maker and operations manager for Good Harbor and the third generation in his family to run the place. He still has cherry trees on his farm but when it comes to comparing the difference between his grapes and cherries this year. . .
"That’s easy because there isn’t a cherry crop this year." Simpson says his family’s switch to grapes was a good move for the business, and says cherry farmers are going to have a hard time this year. "So you feel bad for the people who are solely dependent on cherries this year. In no other industry can you lose 95% of your income and people expect you to do it next year." A slew of 80 degree days in March made the cherry buds begin to swell early this year. But the 19 nights of frost that followed wiped out the cherry crop in the region. Farmers lost 90% of their tart cherries this year. Jeff Andresen is the state’s climatologist and professor of geography at Michigan State University. He says over the past 30-40 years we have been seeing warmer temperatures in the colder months. And spring weather has been arriving a week or two earlier than it has historically. "So that’s a fairly significant change, some years it has been earlier than that, but of course, 2012, our March heat wave is an exclamation point on that trend. That’s the earliest warm up we’ve had in our climate record that goes back around 120 years." Andresen says earlier springs bring a greater risk of late frosts, like the one that wiped out the cherries this year. Sam Simpson at Good Harbor vineyards says grapes are better able to withstand the change in weather patterns Michigan has been getting. They can survive frosts and thrive in mild winters. "Grapes take a longer time to reach bud burst or bud swell when water starts coming into the buds so we were at less risk of frost. We were looking at probably one of our biggest crops we’ve seen off of our vineyards this year." Simpson says farmers have noticed the change in climate and are starting to consider diversifying and growing grapes. "I get multiple phone calls each season of people interested in converting." But getting into the wine industry also comes with a price. Duke Elsner is with MSU Extension. He works with farmers in Grand Traverse County and has noticed the trend to diversify. "It’s not a cheap matter to switch from cherries to grapes. There is quite a cost to remove orchards in the first place and grape plants are expensive." He says a startup investment in wine grapes costs around $10-15,000 an acre. It was a devastating year for cherry farmers, but Elsner says cherries still dominate the region and will continue to do so in the future. He says there is limited land available that is suitable for wine grapes. 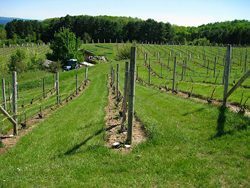 Wine grapes grow well on southwest facing slopes in sunny areas. Although Good Harbor vineyard fared well with grapes this year, the weather did affect the business. The vineyard will not be producing their cherry wine this year.